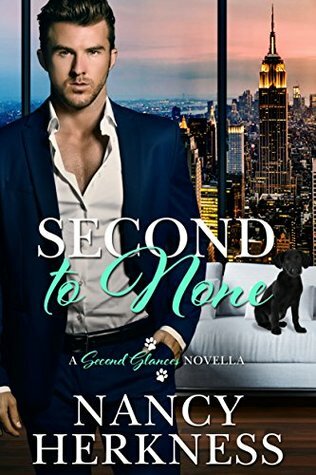 Review: SECOND TO NONE, a novella whose hero is a billionaire who wears his heart on his sleeve — the beginning of a new series! Billionaire chemist Max Varela is selling his company and leaving New York for good when Emily Wade bursts into his office, desperate for his help in funding her program for disadvantaged kids and shelter dogs. Seven years ago, he fell in love with her when she was married to another man. To fight the unbidden attraction, he cut off all contact—but he’s never forgotten her. Ever since her husband died, Emily has poured her heart and soul into the after-school care center. Seeing Max reawakens the pain of her loss, but it also brings unexpected hope for the future. As emotions thought long gone resurface, the two begin a passionate affair that seems destined for a fairy-tale ending. That is, until Max reveals that he’s moving to Chicago in a matter of weeks and wants Emily to uproot her daughter and her life to come with him. If a second chance at love is possible, someone’s got to give. My Thoughts: I always love Herkness’s billionaires. They have all the money they could possibly need, gawking handsome, but find that money is never what completes the heart, the soul, the spirit. They are easy reads and leave you uplifted. Max thought he was over Emily Wade, his friend’s wife. He’d stayed away seven years, built a company making him a billionaire. She suddenly reenters his world. He finds she’s even more attracted to her. She’s changed. He has, too. But that chemistry begins to sizzle again. What changed? Emily’s husband had been killed in action three years previous, enough time to dull the pain. Emily is on a mission when she shows up in his office. She needs money to keep a worthy cause afloat. It didn’t sound very hopeful from Max’s side, but little does she know he cannot get her out of his mind, even though he’s in the middle of finishing a project before the end of the year. He seeks out her project and immediately sees the value of this center. He plot double the money down to make it work. The story will warm your heart. Herkness writes with such poignancy, very often involving animals and children. She will not disappoint you in this novella. If you like hot passionate scenes, Emily and Max make up for lost time, but not before the hope of finding their second chance crashes over their heads. Ah, there’s the rub. This entry was posted in Book Reviews, New Book Release, Novella, Women's Fiction and tagged A Second Glances Novel, Audiobook Review, Nancy Herkness, Second to None. Bookmark the permalink.